– Zach Hyman opened the scoring for the Maple Leafs at 7:46 of the first period and later recorded the primary assist on Morgan Rielly’s third period goal. Hyman has points (2-3-5) in three consecutive games. His goal tonight is his first time scoring the first goal of the game this season. Tonight’s game is his fourth multi-point performance of 2018-19. – Andreas Johnsson scored the second Maple Leafs goal of the game at 14:20 of the second period. Johnsson has goals (3) and points (3-2-5) in two consecutive games. He has recorded 21 (11-10-21) of his 26 points on home ice. – Auston Matthews scored Toronto’s third goal of the game at 16:29 of the second period. Matthews has five points (3-2-5) over his last five games. Matthews has three points (2-1-3) in two games against Ottawa this season. – John Tavares collected the secondary assist on Hyman’s first period goal and later scored the fourth Maple Leafs goal of the game at 18:20 of the second period. Tonight’s game is his 17th multi-point game of the season. Toronto is 15-1-0 when Tavares records multiple points in a game. – Morgan Rielly scored the fifth Toronto goal of the night at 9:12 of the third period. With the goal, Rielly established a new career-high for points in a season with 53 (14-39-53). He leads all NHL defencemen in even-strength goals (13) and even-strength points (13-25-38). 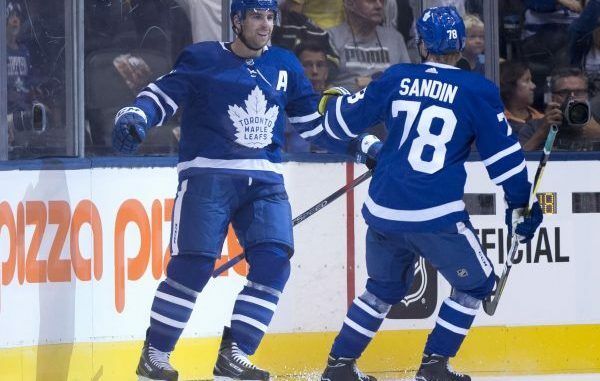 – Mitch Marner registered the primary assist on Hyman’s first period goal and later recorded the primary assist on Tavares’ second period goal. Marner ranks third in the NHL in primary assists (34). He has three points (1-2-3) in two games against the Senators this season. Tonight’s game is Marner’s 14th multi-assist and 20th multi-point game of the season. – Frederik Gauthier had the lone assist on Johnsson’s second period goal. Gauthier has assists (2) in two consecutive games. Seven (1-6-7) of his 10 points have come on home ice this season. – Kasperi Kapanen collected the secondary assist on Tavares’ second period goal. Eight of Kapanen’s 16 assists have come against Atlantic Division opponents. – Frederik Andersen stopped 40 shots to earn the victory. Andersen is 3-1-0 when stopped at least 40 shots. – The Maple Leafs are 17-11-1 at home this season. – Toronto’s all-time record is 53-51-3-11 in 118 games against the Senators and 29-22-2-7 in 60 games played in Toronto. – Toronto is 20-10-3 against the Eastern Conference this season and 8-6-3 against the Atlantic Division. – Tonight’s attendance was 19,264. – The Maple Leafs were 2-for-2 on the penalty kill and 0-for-1 on the power play tonight. Toronto is 20-9-1 when not allowing a power play goal this season and 18-12-3 when not scoring a power play goal. – Toronto is 24-5-1 when scoring the first goal of the game. – The Maple Leafs are 8-6-1 when tied after one period and 26-0-0 when leading after two periods. – Toronto is 18-7-3 when outshot by their opponent. – The Maple Leafs are 5-1-0 in Wednesday games. – At 0:53 of the second period in tonight’s game, the Situation Room initiated a video review to further examine a play at the Toronto net. Video review determined that the puck did not completely cross the Toronto goal line. No goal Ottawa. – Jake Muzzin skated in his 500th career NHL game. – John Tavares was on the ice for a team-high in Toronto shot attempts-for at 5-on-5 (23). Tavares had a 5-on-5 shot attempt percentage of 60.4 percent (23 for, 15 against). Probably turnovers. The bottom line is I thought we were really ready to play, I thought we started and I thought we were playing well. Then we just got careless and we never really seemed to be able to get it back. At the same time, when you’re a good team, you win games sometimes that aren’t very pretty, but you still won. At the end, when we get up tomorrow and look at the standings, it’s going to be pretty. I thought he played hard. He plays around the net and plays hard most of the time, it’s nice to see guys rewarded. I thought [Gauthier]’s line was real good tonight too. [Johnsson] got us going in the second there and we just came off it. I thought that was good. Freddie [Andersen] at one point had to make a few saves in a row. We found a way to win a game I didn’t think — I thought we started great, I thought we were organized, I thought we looked good and, in the end, we weren’t as good as we wanted to be. But I think suddenly now we’ve got points in five straight and seem to be going in the right direction. On Andersen’s sprawling saves in the second period. When you start making the save when you’re on your back and the puck is behind the net, it’s probably going to be ugly, but he kept it out so good for him. It was definitely a good start for us, we were outshooting them 9-1 or something like that. They got on us really quickly, it was 11-11 by the end of the period. Two different kinds of games for us in the first period. We got back on track in the second half in that second period, so it was good. Mo made a great play skating and then got it to me. I just wanted to try to be like Mitch there. No, I just wanted to try to get it back door and it’s good he was there to put it in… I didn’t really think about it too much. I just wanted to put it in a space for him, he was driving hard. I just put it there. It’s not often it’s a backhand shot. I was just trying to get it as quick as possible when I got to the net and the backhand was the first thing that got in my mind so that was nice. It was huge, of course. It changed the game, totally. If they scored there, that’s a bigger lead for them so it was huge for us. It felt good. I think our line wasn’t as good as we’d like it to be. I think we can be a lot better. It’s nice to obviously score, it’s always nice to score and contribute so hopefully have a couple good days here and get ready for a big game against Montreal on Saturday. Yeah, it’s the NHL so it doesn’t matter who you’re playing on any given night. It doesn’t matter what the standings are. They’re going to work hard and give you a game so obviously a couple big goals from a couple different lines that gave us a good lead and then we just stopped playing. They’ve got some skilled players that can make plays and they crawled their way back so we’ve got to give them credit but it’s good for us to learn from that and obviously come out with the two points. There were periods of the game where we felt really good about the way we were playing but that being said I think there were parts where we got away from our game plan a little bit, but I think for the most part there were some good things that happened. The end result was obviously what you want. There are a lot of good teams in this league and anyone can win on any night so we knew what to expect. We knew they would come out and skate. Those guys have a lot of pride, they’re out there working hard. You don’t even look at standings, you don’t think about that you just go out there and try to play your best. Hopefully you win more than you lose. It was a lot of back and forth obviously tonight. I thought we got off to a really good start, really building off the last couple of games. They pushed back hard, give them credit. They forechecked hard and they send everybody. They’re not shy to take some chances. I think at times that’s going to give you some opportunity, especially when we execute the way we can coming out of our own end and through the neutral zone, but also, you’ve got to be careful you don’t fall into that trap. It can lead to some mistakes and them taking advantage. It happened to us at times. Certainly, when we execute well and we’re able to get out of our zone with our speed and our ability to move the puck fast, that allows the transition game to be effective like it can, especially — all four lines can play and contribute that way. Good to see we got some opportunities that way and capitalized. No, for sure, I agree. I think sometimes you start to get it at this time of year, some teams that are down in the standings. There’s — I don’t want to say that they’re loose — but they start to play with a little bit of we might as well go for it all. There’s really no reason to hold back considering the way their season has probably gone. They’re playing aggressive and they’ve got a lot of guys that are very motivated and certainly they have a ton of talent as you see in some of their young guys — the way Chabot can play — and how dangerous they are up front. They’ve put up a lot of goals this year. We knew that coming in and we just wanted to make sure we slow them down as best we could and play with the puck. We did that at times and at other times we were probably a bit sloppy. Good way to handle the adversity. Like you said, you can’t take anyone for granted in this league.